Patio Paradise sun shade sail could bring your outdoor spaces a totally different experience during the warm months of the year. Rather than hiding away during the best parts of the day, with our sail shade you can spend time out of doors enjoying the fine weather. The shade shelter provides 88% up to 95% UV block while allowing cooling air circulation. Heat and glare are significantly reduced so the shade sails can make you comfortable even in the hottest days. Want customized size ? Call patio paradise now! Call us on 909-364-8958 now to place order for a customize size as you like! The customize order will take 3-5 day longer to ship out, please note that our custom sun shade sails are made case-by-case and cannot be resold so please pick your size carefully. Feel free to call us on 909-364-8958 or email on cservice@patio-paradise.com if you have any questions. 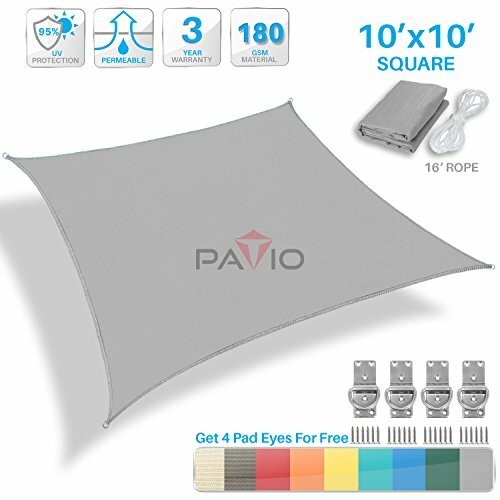 Includes one piece 10' x 10' AREA FIT Square sun shade sail with curved sides, a 16 Feet PE rope, and an instruction sheet. The fabric is made by light grey fabric with white stripes to give it a AREA FIT light grey appearance. Made of 100% brand new high-density Permeable UV Block Fabric 180GSM polyethylene knitted fabric material. Made so that no water is accumulated on top during rainfall, 0% recycled material,3 years warranty under normal usage and normal weather conditions. Easy to Installation and Maintenance - with provided detailed instruction. Easy to clean with mild detergent and water, fade resistant, will not mold, mildew, stain, or tear.